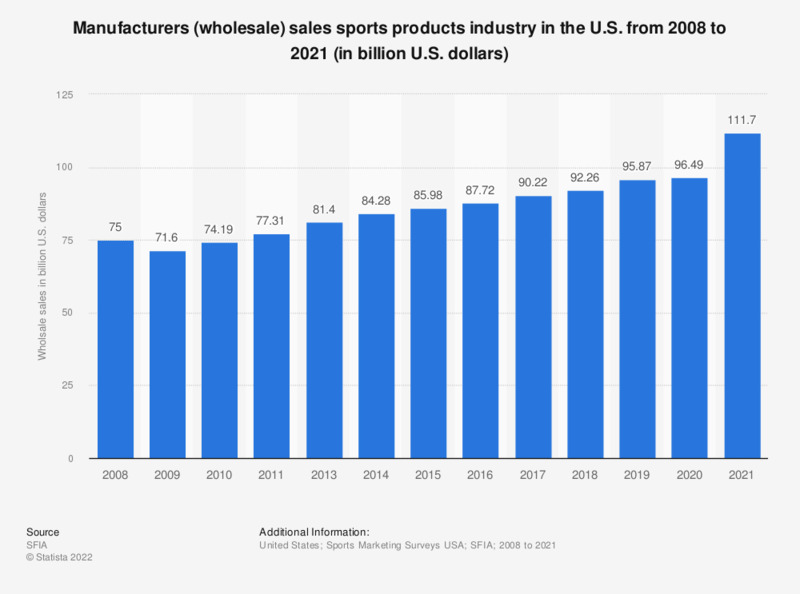 The statistic depicts the manufacturers (wholesale) sales of sporting goods equipment, fitness equipment, sports apparel, athletic footwear, and sports licensed merchandise in the U.S. from 2008 to 2017. In 2017, wholesale sales amounted to about 90.22 billion U.S. dollars. Wholesale sales of sporting goods in the U.S. reached 90.22 billion U.S. dollars in 2017, the highest figure to-date and a six billion U.S. dollar increase on the figure from 2014. The biggest sector in this industry is athletic apparel, which generated U.S. wholesale sales of 34.88 billion U.S. dollars in 2017. Sporting goods equipment made 24.87 billion U.S. dollars and athletic footwear contributed a further 15.82 billion U.S. dollars. Of the athletic apparel sales in the U.S. in 2017, over 16 billion U.S. dollars came from branded clothing. The single biggest athletic apparel brand in the U.S. and worldwide is Nike, whose sales of sports clothing reached almost five billion U.S. dollars in North America 2017, a more than twofold increase on the figure from 2011. Adidas is also a major sports apparel brand in the U.S. Its global sales of apparel topped 7.7 billion euros in 2017. * Sporting goods equipment, fitness equipment, sports apparel, athletic footwear, and sports licensed merchandise. All figures are based on manufacturers' shipments in the U.S. market and expressed in wholesale dollar values.